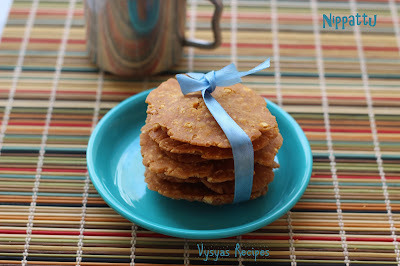 Nippattu is a Popular South Indian snack, made during festive Occasions like Diwali, Krishna Jayanthi & Ugadi.It is called Nippattu in Karnataka,Chekkalu in Andhra & Thattai in Tamil Nadu. This Cripsy crunchy snack is a Great Tea time & Travel time snack. As diwali is near by, I am Posting this crispy crunchy Snack. Peanuts & fried Gram(chatni dal)- 1/4 cup. hot oil - 2 tbsp. chilli powder - 1+1/2 tsp. Remove the skin of Roasted Peanuts.Then Grind Roasted Peanuts, fried gram & cashews into a little coarse powder. In a Mixing bowl add Rice flour, Ground mixture,chilli powder,hing, hot oil and salt, mix well. Then add water little by little, to get firm dough. Take lemon sized dough, grease the plastic sheet or ziplock cover,then place lemon sized dough & flatten it with your finger tips. Heat the heavy bottomed kadai with oil, when it is hot Keep the temperature to medium & drop the flattened dough Gently & deep fry the thattai's, until it turns crisp and Golden brown as shown in the picture. Place it in a kitchen towel or tissues to absorb excess oil. Then finally place it in a air tight container.This is a perfect crispy snack for diwali. you can add 1/4 cup grated dry coconut to get extra taste. you can add 1/2 tsp of sesame seeds to get extra flavour. To check the temperature of oil, drop the pinch of dough in hot oil, if it raises immediately it is an indication that oil is in correct temperature else heat the oil for few seconds. flatten the dough as thin as possible to get crispy Nippattu. Such a lovely and delicious festive recipe. 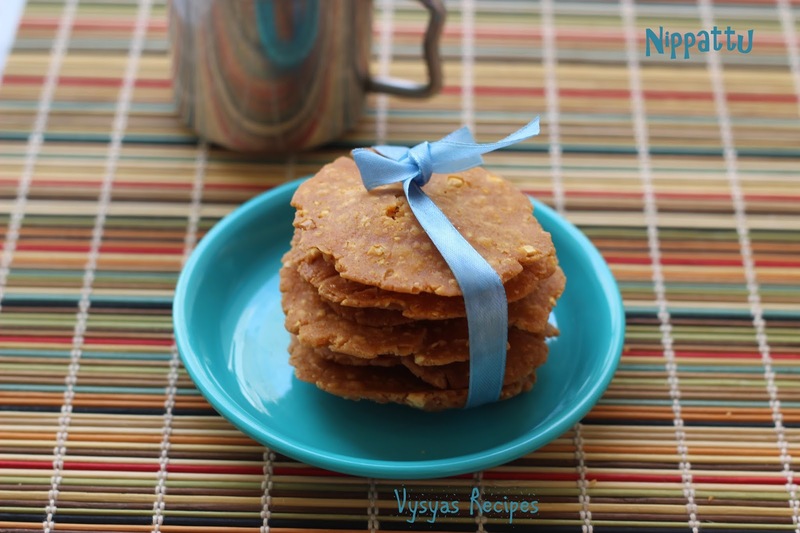 Delicious & different snack..............congrats for your Diwali recipe featured in magazine.